Stacy Horn » Blog Archive » Why are there no sitcoms about people like me? Why are there no sitcoms about people like me? And by me I mean middle-aged, single, pathetic, but not completely unendearable (I just made up that word) and funny (what?). Finding a man would only be a minor side-plot, a running joke, like the conveyor belt of secretaries on Murphy Brown. I don’t mean that as a anti-man thing, but that’s what it’s like, going both ways. I think it’s a combination of we’re all the left-overs and we just don’t have the energy for dating we once had. If the sitcom were being made today I’d make finding a job the major focus. That could provide plenty of laugh-until-you-cry material. 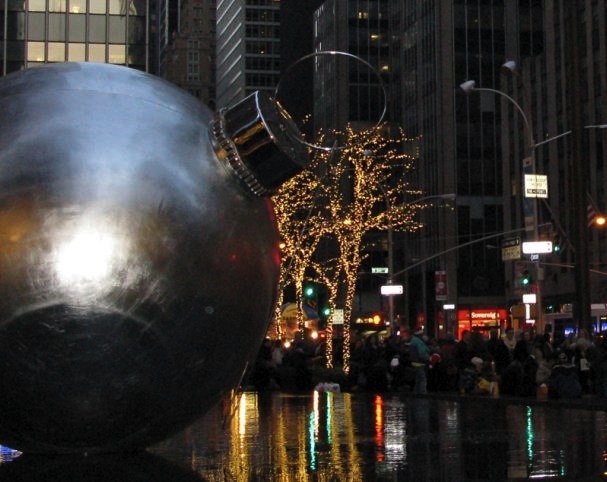 A giant bulb decoration. It’s terrifying, right? Try batting that around, cats. Maybe I’m deluded, but I always tend to think of you as a glamorous, cosmopolitan New York City writer with a literary following. (And two cats.) Am I wrong? I totally agree with Greg on you being glamorous and cosmopolitan. However, please do develop a sitcom that is set in NYC that will be better than “Two Broke Girls,” which is awful. LOVE the giant ornament. Would love to see your kitties take a whack at that. But I’m a single woman with cats who watches a lot of tv! It’s not just the place. And you should never describe yourself as a loser, even if you feel un-glamorous. No one who can write like you is a loser. I still think of “The Restless Sleep” as one of the most finely put together books I’ve ever read. Loser, indeed. It’s up my Radio City, actually, and thank you. CR: That is the nicest thing anyone has said to me in a LONG time, thank you so much. Especially about Restless Sleep, which I’ve gotten such mixed reviews about!